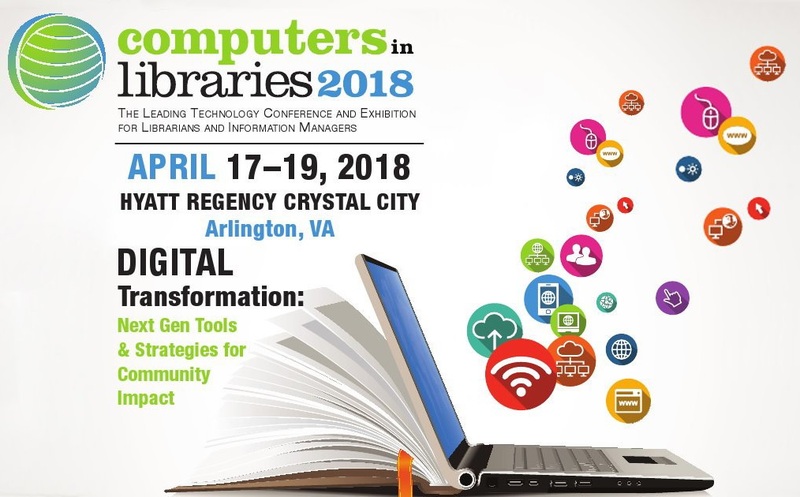 In April, Joel Hartung attended the 33rd annual Computers in Libraries Conference in Arlington, Virginia. The theme was “Digital Transformation: Next Gen Tools & Strategies for Community Impact.” The conference included networking events, workshops, an exhibit hall, and an extensive list of speakers from academic, public, school, and special libraries. Despite all the people from different types of librarians in attendance, there was one large connection: a shared interest in library technology. While Joel was unable to attend any of the pre-conference workshops, they focused on a wide-array of library and technology related skills. Cybersecurity, strategic technology planning, makerspaces, virtual reality, and data visualization took center stage at these interactive workshops. Next time, he will definitely consider registering for these extra sessions which provide a deeper dive into a topic. Despite not attending the pre-conference workshops, he had more than enough to occupy his time during the full three day conference. He attended fourteen conference sessions and spoke with dozens of vendors in the exhibit hall. Vendors showcased hardware and software solutions, including scanning and digitizing equipment, electronic lockers, book vending machines, databases, and other software solutions for common library challenges. The conference sessions he attended focused on library systems automation, user experience design, management skills, and metrics. The huge variety of sessions available made it sometimes difficult to choose which to attend. Joel attended this same conference a few years ago, which proved very useful as the Library was undergoing planning for a new website. The experience and contacts made at “Computers in Libraries” has been invaluable in his career, and he looks forward to seeing what is in store for the future of this annual event. Originally posted in the Freeman/Lozier Library’s quarterly newsletter, More Than Books, V. 21 No. 3, Summer 2018.